Shawn Flot is an extraordinary healer. He practices manual physical therapy, is versed in many forms of education, and also deeply devoted to the practice of Hatha Yoga. I had the honor of being an accomplice in website design — Shawn is artistic with a vision of how he wants to share the message of his knowledge. He contacted brilliant photographers about images that speak volumes to him about the journey of moving to harmony. He personally created the icons on this site. Every choice he made has a reason. As you explore this site, we know you’ll feel Shawn’s passion and expertise. My family also had the good fortune of working with him in a physical therapist aspect. I’ve seen many people for my lower back pain, but Shawn was utterly different, and is making a big change in the long run. My son broke his femur and returning to running brought some challenges. Shawn helped diagnose the issue and release the tension. It’s not every day that one encounters a gifted healer like Shawn, nor does one have the joy of working creatively side-by-side. 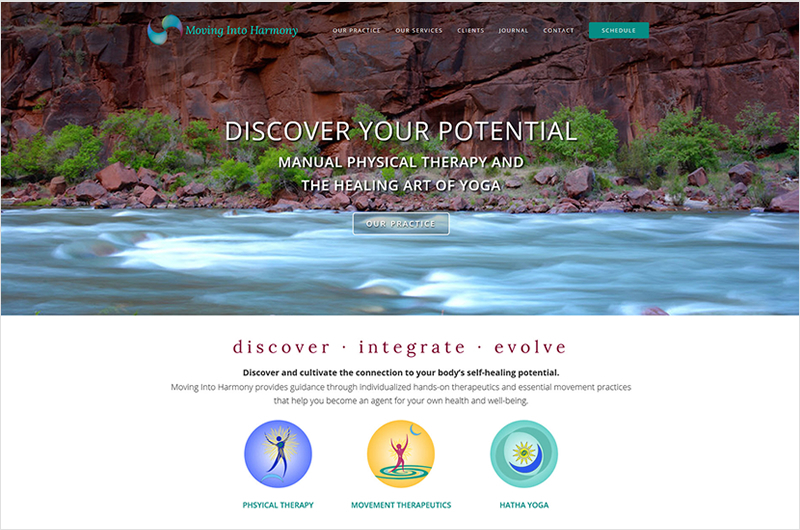 It is with honor that we bring you the new Moving Into Harmony website. Erin provided not only superb design and technical services, but also kept our project on track when we got busy elsewhere and could have let the momentum dwindle. Our website stands out in a field of typically uninspired and predictable formats, thanks to Erin’s keen eye and expertise. We would give Ruby Slipper our highest recommendation to anyone seeking a fresh approach with a wonderfully responsive designer. Working with Erin at ruby slipper designs was a complete pleasure. She was great in helping me process out exactly what I was conceptualizing for my site. The process was thorough, fun and creative. I was most pleased with the outcome and Erin's insights about aesthetics was top notch! She was also very patient and helpful with explaining the "techie" aspects of Word Press, which I really appreciated. Erin is the best, this is the second website she has helped me with in the past 10 years and I will always be a returning customer if the need arises. I could not recommend her more. Erin did a phenomenal job with our website! She was fast, attentive, and on point with everything. Her eye for design and color is amazing, and she was able to grasp the vision we wanted right from the start. I would highly recommend using her. The website is absolutely wonderful and really communicates the identity of Charlie, and the Institute, beautifully! You were the driving force behind pulling all of it together. Really, you are awesome and I appreciate you and all you do so very much! You’re off to see the Wizard!